We offer a wide selection of imported, exclusive, handmade, recycled glass beads, resin amber beads and beads made of natural material. Our travels took us to Indonesia where we discovered the beautiful handmade, recycled glass beads and other special beads. We personally source every style and colour and import this to South Africa. These beads are not only wearable art pieces, but are also used as accessories in interior design where it can be displayed as table decorations, wall hangings or used for decoration on home accessories. We do not sell any loose beads. Most beads are pre-strung on cotton cord and each string contains more or less 450mm of beads. A piece of cotton cord is visible at one end of the string. The pre-stung beads can be worn as is for the length of strings is long enough to fit over one’s head. 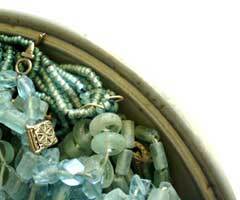 Beads can also be restrung and combined with metal like silver and pewter. It makes a beautiful combination with natural material like wood, coconut, shell and ostrich shell as well as with other types of glass beads. For more information on this visit Inspirations for interesting ideas. Bead Business has no retail outlet. We are a mail order company and accept internet and mail orders. If you are in the vicinity of Stellenbosch or Hermanus (both in the Western Cape, South Africa) you are welcome to experience the product first hand by making an appointment in advance. Thank you for your interest in Bead Business and browsing this website. We look forward to providing you with exquisite products and excellent service.